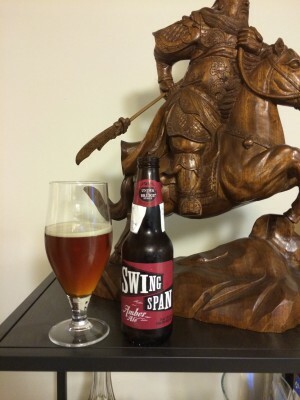 The Granville Island Brewing Company of Vancouver, BC, brings us the Swing Span Amber Ale. Starting with a deep honey brown colour with great clarity and just a little visible carbonation and a cream tan head this is a good looking beer. I am drinking it on a nice, cool summer night after a good gym session and it looks exactly like what I want to drink right now. The aromas just roll right off this beer, I don’t even have to have my nose up to it to get a good whiff of honey. Under that initial note I get a bit of clover and sweet malt. Nothing is really heavy on the nose but the aromas are pronounced and easy to pick out. The Mosaic and Cascade hops are noticeable on the tongue on the first sip. There is a light bitterness to start mixed with burnt honey. A touch of smoke lingers before a bitter finish that brings out some nice herbal notes. All of this is wrapped in a nice, round mouthfeel with a slightly astringent carbonation on the back of the palate. I like the balance of sweet, bitter and smokey in this beer and I think I would like to drink this with a mild red meat like lamb. This entry was posted in Amber Ale and tagged amber ale, granville island brewing. I found that this is their best 6 pack beer, actually a pretty good one too.